A good hot tub cover is an investment that can not only protect your hot tub from the elements, it can also save you money. It helps maintain temperature, and keeps foreign matter from affecting water chemistry. 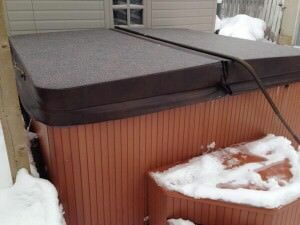 A high quality hot tub cover can last several years. Unfortunately, no matter how high the quality of your new hot tub cover. Eventually it will wear out and need to be replaced. 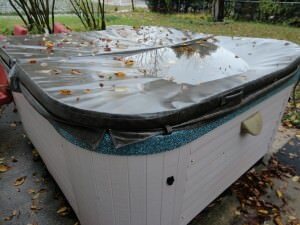 How do you tell when you need a new hot tub cover? It’s surprisingly easy. If your cover is sagging, whether in the middle or towards one side, that’s a problem. 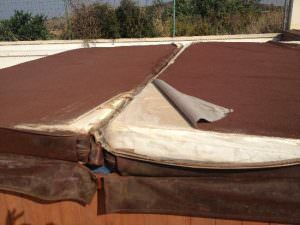 Sagging means that the structure of the cover material has been compromised. It is also an indication that more serious problems are on their way. 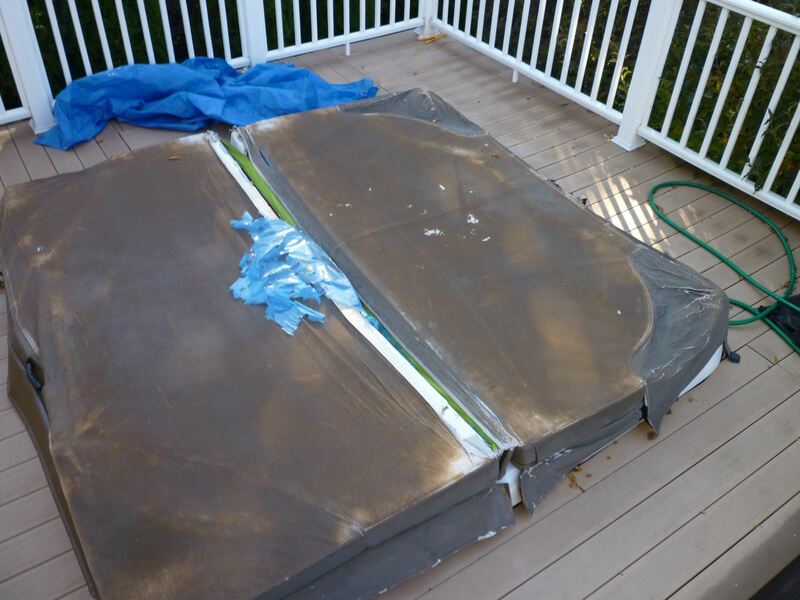 Your hot tub cover sags because the foam cores are broken, and/or because the reinforcing has failed. This makes the cover less structurally sound, meaning it can’t hold up to the same level of weight on it, from either rain or snow. Once the structure has been compromised, it will only get worse, not better. After enough time in the heat and cold and sun and rain and snow, even the best vinyl will start to wear. Most often this wear shows up in the form of cracking as the vinyl dries out. It is also fairly common for the color of the cover to fade over time. Fading colors are generally only a cosmetic issue: important, yes, but not critical for most people. Cracking, on the other hand, is a very serious problem. When the vinyl on the outside of your cover cracks it exposes the inner foam cores to the elements, in particular to water from rain and snow. This will eventually lead to a waterlogged cover (more on that later) and can also make it more difficult to maintain proper water chemistry. This is especially true if the cover is compromised on both the outside and the inside. If you can hear an uncharacteristic whine of your cover lifter. Maybe you have developed a hernia when using your manual lifter. If you don’t use a cover lifter and now need three people and the Dallas Cowboy cheerleaders just to get the cover off your spa, you’ve probably got a waterlogged cover. 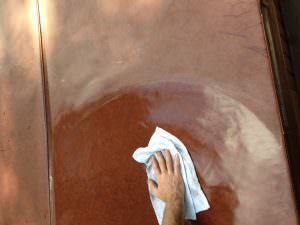 Over time the outer vinyl can crack and the moisture seal on the underside of the cover can degrade. This lets moisture soak into the foam core of the cover. This makes it several times heavier than it should be. This increased weight is a symptom, though, and isn’t the real problem. The real problem is that a waterlogged cover can’t do the main thing a cover is supposed to do – insulate against heat loss. The foam in your hot tub cover is made of bajillions of tiny little bubbles that trap air. Air is a heat insulator – it doesn’t let heat move from one place to another very well. Water, on the other hand, conducts heat very well. This is why frozen food thaws out more quickly sitting in a bowl of water than sitting on your kitchen counter. If your hot tub cover is full of water instead of air. It is basically letting all the heat out of your hot tub. Does your hot tub cover have a smell? If the smell is anything other than the smell of marine grade vinyl and hot tub chemicals you have a problem. Some of the things that you tend to get when you have several cubic feet of foam filled with warm water are mold and bacteria and fungi. Most of those things smell bad, and none of them are good for your hot tub cover. There is also no way to fix it once it starts to stink. For some of these problems it is possible to repair the hot tub cover. Particularly if you catch the problem early. Torn vinyl is fairly easy to fix with a vinyl repair kit, or temporarily with duct tape if you aren’t concerned with how it looks. Cracking, though, means the vinyl has become structurally weak and that isn’t something that can be patched. If the cover is starting to sag, it might be possible to remove the foam cores, flip them over, and put them back in the cover. You shouldn’t count on this being a long term solution, though, as the foam is already weaker than it should be. It won’t likely last much longer the other way, either. If the foam is waterlogged and/or smelly, there’s really not much you can do. Do You Need a New Hot Tub Cover? In all these cases, the best option is almost always to replace the cover with a new one. So the end result is maybe you need a New Hot Tub Cover. If that is the case make sure to do your research on what hot tub cover suits your needs best. Covers have probably changed a bit since you had this last one replaced. Look into the right thickness and for sure the best price for the best quality. We are biased of course and know that The Cover Guy provides this. There are some great articles that help you decide on what you need for a cover. What is the best thickness of hot tub cover I need for my hot tub or spa.